Al Jahra (Arabic: جهراء‎) is a ceety locatit 32 kilometres (20 miles) north-wast o Kuwait Ceety in Kuwait . Al Jahra is the caipital o the Al Jahra Govrenorate as well as the surroondin Al Jahra Destrict which is agriculturally based. Encyclopædia Britannica recordit the population in 1980 as 67,311. Housomeivver, syne the Gulf War, the population haes appeared tae hae declined, wi a population o 14,658 fowk recorded in 1995 an an estimate o 24,281 as o 2009. 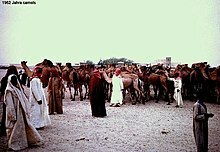 Al Jahra was ance dominatit bi agricultural land an began as a sma oasis veelage. Historically it became kent as a notable tradin point for camels an a stoppin place on the wey tae Kuwait Ceety. It gradually grew intae a toun an the historic Red Fort (Qasr Al-Ahmar) o Al Jahra wis built. Al Jahra wis the steid o the Battle o Jahra in 1920, a conflict atween Kuwaiti an Saudi forces. The day there is a naitional monument commemoratin the battle. The conflict wis settled in 1922 when Keeng Abdul Aziz al-Saud recognized the unthirldom o Kuwait in exchynge for territory. Al Jahra is locatit 32 kilometres (20 miles) north-wast o Kuwait Ceeity an is connectit bi a series o ring roads. Heich-gate 80 connects the ceety tae Abdaly on the Iraqi border. The heich-gate haes become kent as "The Heich-gate o Daith" due tae its involvement in the Gulf War when the Allee'd troops destroyed an Iraqi convoy. 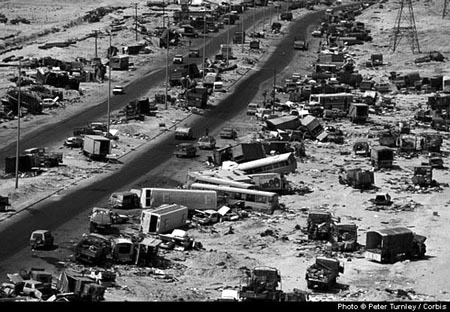 The road wis repaired durin the late 1990s, an wis uised in the initial stages o the 2003 invasion o Iraq bi U.S. an Breetish forces. The day there is a blue sign at the Multa'a Ranch turnaff readin, "God Bless U.S. Troops". The surroondin aurie is desert but tents are aften seen locatit alang the heich-gate. The nearest airport is at Kuwait Internaitional Airport. The main fitbaa team is Al Jahra (fitbaa club). They play at the 25,000 capacity Al Shabab Mubarak Alaiar Stadium. They hae wan the Kuwaiti league, unner the auld name o Kuwaiti Premier League ance in 1990. They pairticipatit in the Kuwaiti Premier League 21 times durin the 2007-2008 saison. Al Jahra hae reached the Kuwait Emir Cup Feenal twice in 1996 an 2002, when they lost tae Al Arabi 1-2 an Kuwait Club 0-1 respectively. Khaima Mall in Al Jahra an aa contains a notable fish mercat. ↑ "Jahra, al-." Encyclopædia Britannica from Encyclopædia Britannica 2007 Ultimate Reference Suite. ↑ 5.0 5.1 5.2 "Jahra and Northern Kuwait". Pbase. Retrieved September 21, 2009. ↑ "Kuwait Emir Cup 1995/1996". Goalzz.com. Retrieved September 14, 2009. ↑ "Kuwait Emir Cup 2001/2002". Goalzz.com. Retrieved September 14, 2009. Wikimedia Commons haes media relatit tae Al Jahra. This page wis last eeditit on 20 November 2013, at 21:05.